Perched at the base of the northeast hillside of campus, the Cerro Vista Apartment community overlooks Cal Poly, offering gorgeous views and easy access to nearby hiking trails. Each apartment provides direct outdoor access and has a full kitchen, living room common area, two suite-style bathrooms, and three to four bedrooms. Bedrooms provide single- and double-occupancy accommodations. Apartment are separated by gender unless the student specifically requests gender inclusive housing. The community center includes a game room, study lounge, private study rooms, and a community kitchen. 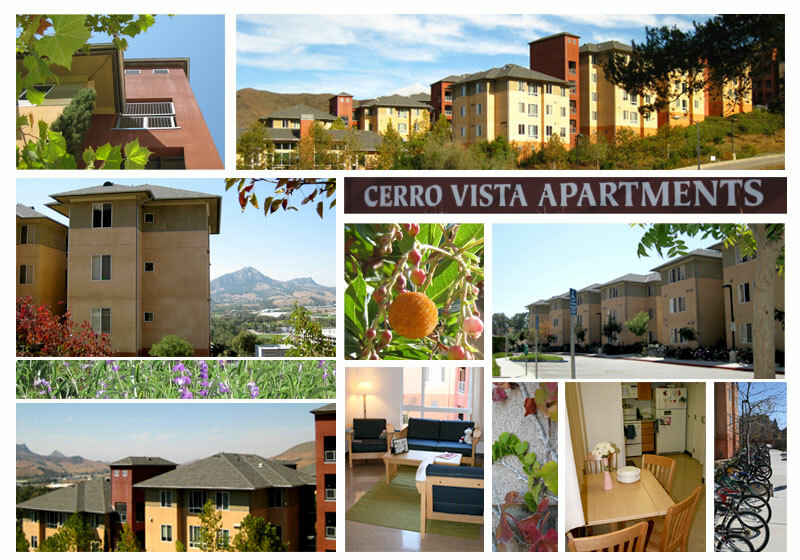 Students wishing to stay on campus over winter break must request it during the application process and live in Cerro Vista Apartments during the fall quarter. For more on winter break housing, see Additional Housing Options. 4 Person - Single Bedroom Apartments: Each bedroom is single-occupancy and contains a desk and chair. Four bedroom apartments house four residents.